Puree boiled potatoes in a wide bowl. Add egg, milk, salt, black pepper and butter. Transfer into a Pyrex Dish. Meanwhile, sauté onion with olive oil and stir in garlic. 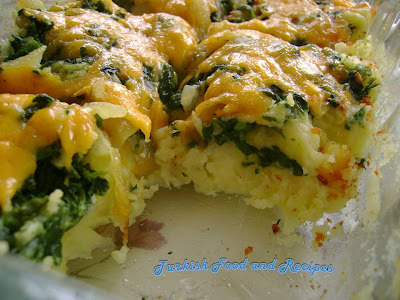 After a while add spinach and cook for 4-5 minutes over medium heat. Spread it over potato puree. Sprinkle cheese all over. Bake at 400 F (200 C) oven, till the top gets lightly brown (for about 20-25 minutes). Serve warm. Haslanmis patatesleri genis bir kasede blendir ile pure yapin. Sut, yumurta, tuz, karabiber ve tereyagini ilave edin. Borcam bir tepsinin dibine yayin. Bir tavada sogani zeytinyaginda sote edin. Sonra sarimsagi ilave edip, biraz cevirin. Ispanagi icine karistirin. Orta ateste 4-5 dakika pisirin. Purenin uzerine yayin. En ustune peynir serpin ve 200 C (400 F) firinda uzeri hafifi kizarana dek 20-25 dakika pisirin. I have made this twice now. First time exactly as you made it, the next time I browned 1lb of ground turkey and used southwestern spice blend and spread it over the potatos. It was a big hit in my family. Thank you for this recipe! 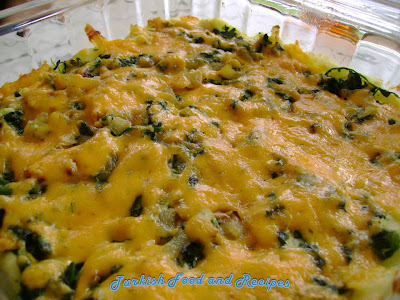 I was searching on Google for "spinach casserole" and I found this recipe - it looks like exactly the kind of thing I like and I'm going to make it. You really can't go wrong with something like this; I already know it's going to be great. I made this for the first time and it was great. I can't wait to make it again it looked just like the picture. i made this casserole for a potluck get together and it was all gone. very delicious!!!! Potatoes are boiling now...this looks delicious. Can't wait to try it tonight. Hello. Does the recipe call for 1 cup of each kind of cheese (1 cup of cheddar, 1 cup of swiss, 1 cup of mozzarella) or a total of 1 cup of the 3 cheeses?